Almonds are real expensive, y’all. I live in California, and we grow a lot of almonds here. Almonds require a lot of water to produce, and California has endured a massive drought for the past 10 or so years (we’ve found some relief thanks to the snowy and rainy winter of 2016-2017.). Drought = expensive almonds. Almonds are pretty ubiquitous these days: almond flour, almond milk, almond butter, and you’ll find them as the base of many a trail mix. They do provide health benefits to the brain, skin, and cardiovascular system due to their monounsaturated fats, vitamin E, and trace minerals. They’re a good source of fiber, too, at 5 grams per 1/4 cup. We need 50 grams of fiber ideally daily, and most adults get less than 20 grams. I use quite a bit of almond butter; it’s great in smoothies, on apples, or on a spoon straight out of the jar with raw honey for an afternoon energy boost. 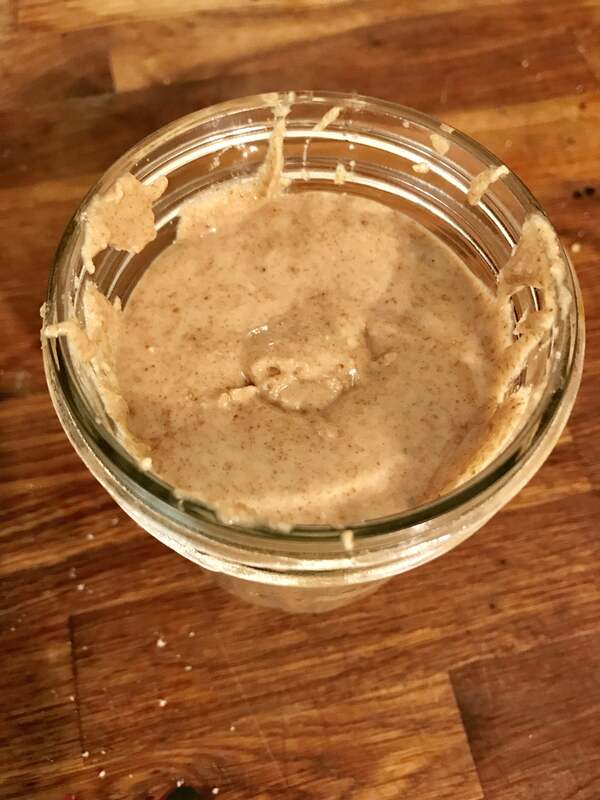 Almond butter is expensive, too. I see it for $15.99 at my local market, and Justin’s almond butter is anywhere from $12-$15. 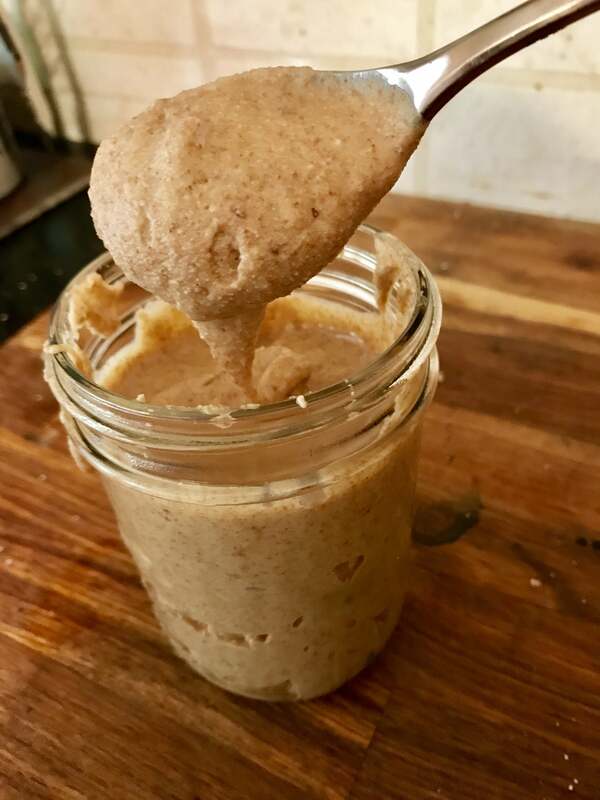 Almonds are cheaper in the bulk bin, and when I recently came across non-pasteurized almonds for $6.99/pound at a fruit stand, I jumped on ’em, and my first thought was homemade almond butter. Side note: it’s very hard to find truly raw and/or unpasteurized almonds these days. 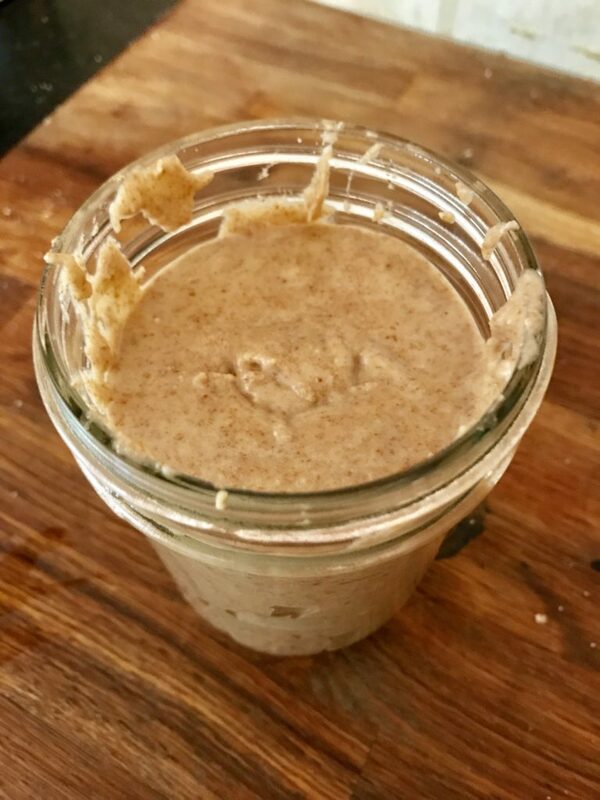 It’s super easy to make almond butter at home. 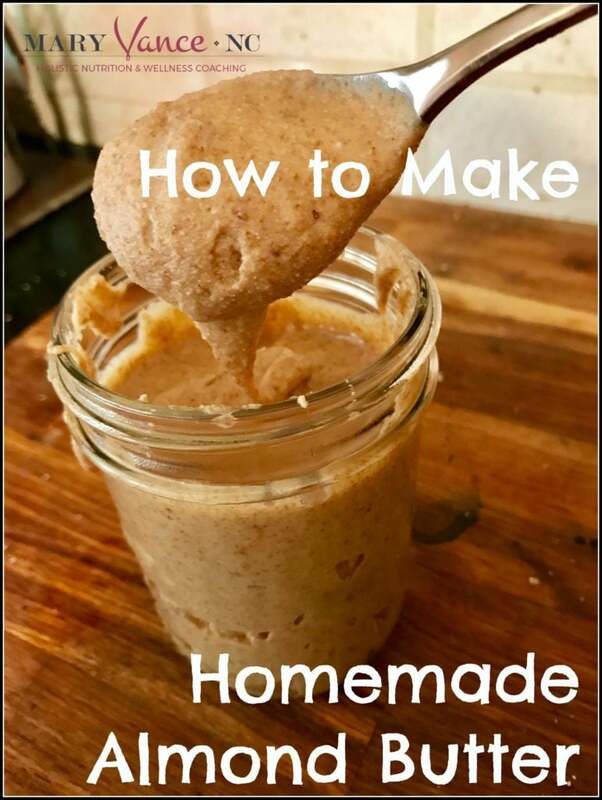 You’ll save a ton of money, and all you need is a food processor or VitaMix, and about 20 minutes. 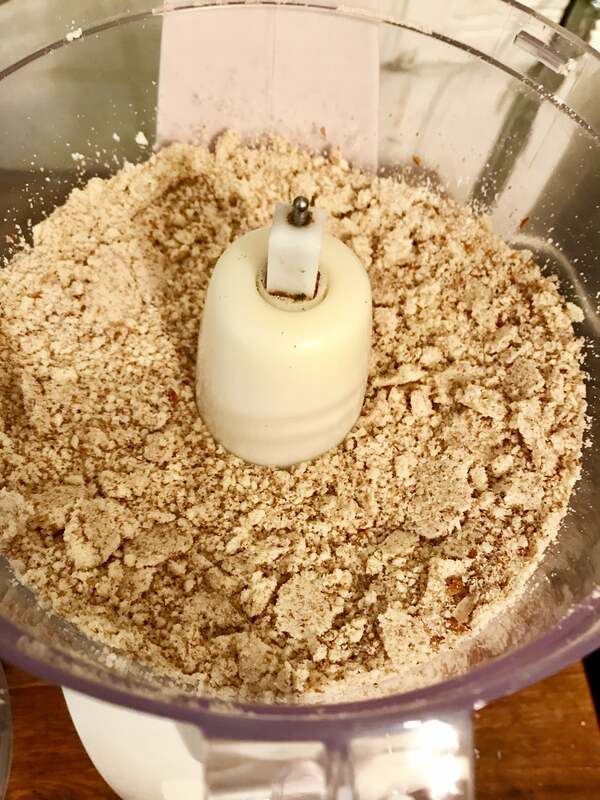 Step 1: dump almonds into food processor. Pretty easy, right? I had a pound, but any quantity over a cup or so will do. 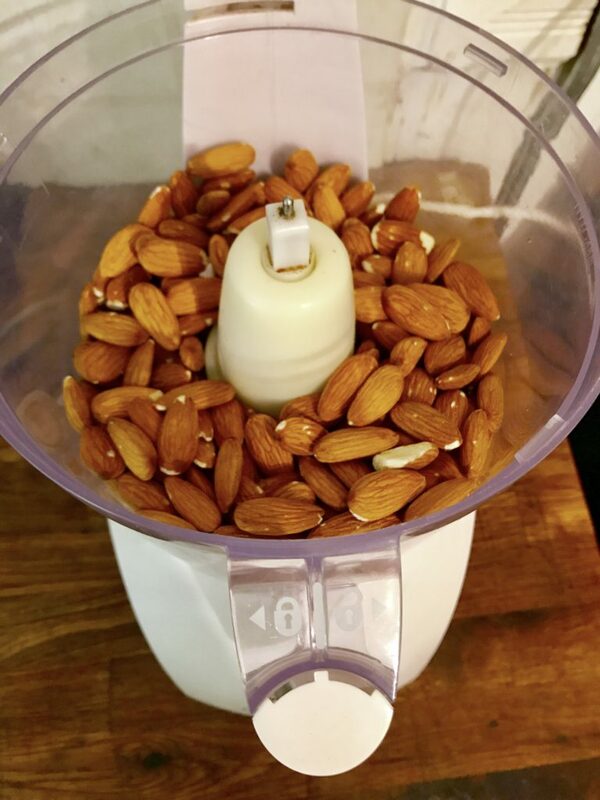 I’ve heard that warming the almonds first will help them release oils for a smoother and faster butter, but I haven’t tried it. Step 2: start the blending! You’re gonna be processing for a while. It’ll start to look like almond meal first. 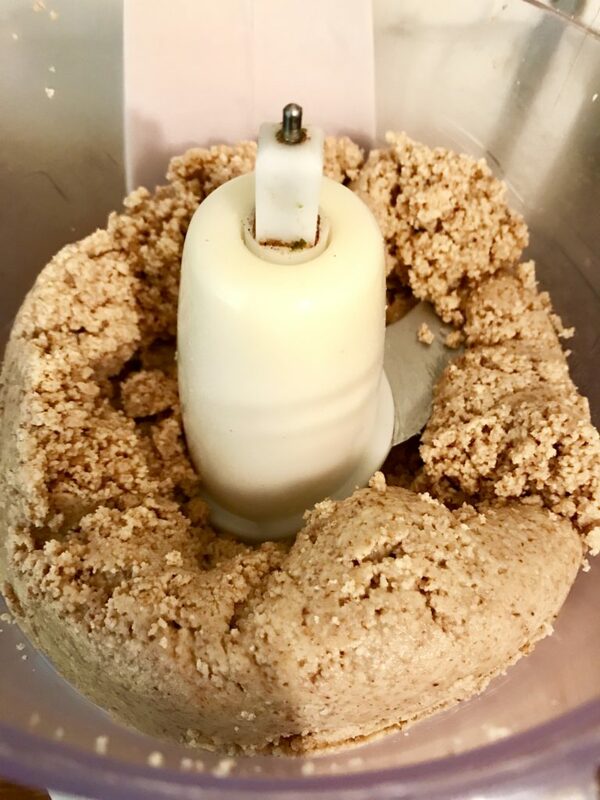 Step 3: keep processing. I stop and give the food processor little breaks, and you’ll need to scrape the sides. After about 10 minutes it’ll start to take form. At this point you can drizzle a tbsp of coconut oil in to help it emulsify. 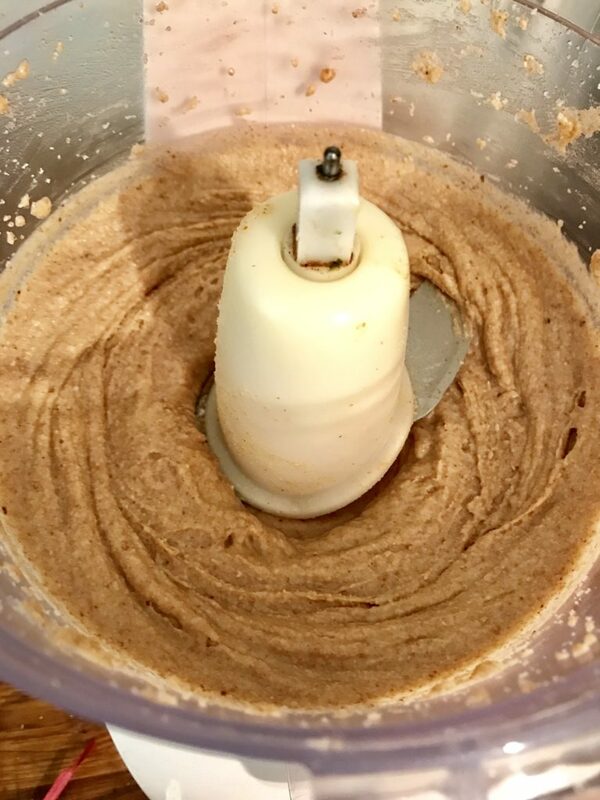 Step 4: Keep blending. I sometimes add some honey and vanilla and/or a pinch of sea salt at this stage. It looks like this after about 15 minutes. 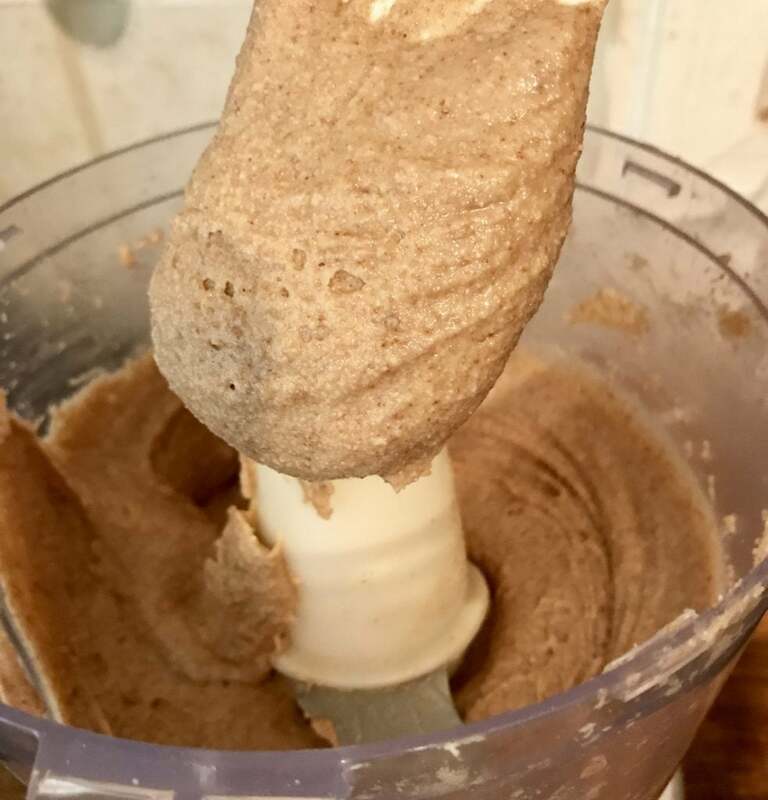 It should start to come together at a nut butter consistency between 15-20 minutes as it gets warm and the oils are released. You can stop with any consistency you like. This is about 18 minutes. Step 5: It’s finished at 20 minutes! Ready to be put into a jar. This made about 12 ounces. I store it in Ball jars in the fridge. Don’t store it in plastic, as the oils react with the plastic, which makes it taste bad. It’s a little messy because that’s how I roll in the kitchen. And there you have it; ready to go. Easy, right? 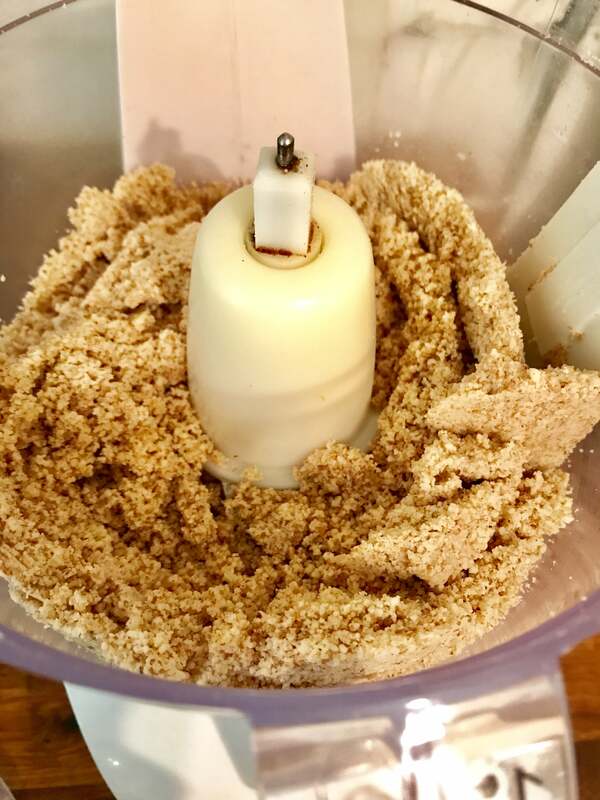 Place almonds in food processor. You can also use a VitaMix I'm told, but I don't have one and don't know how that works. 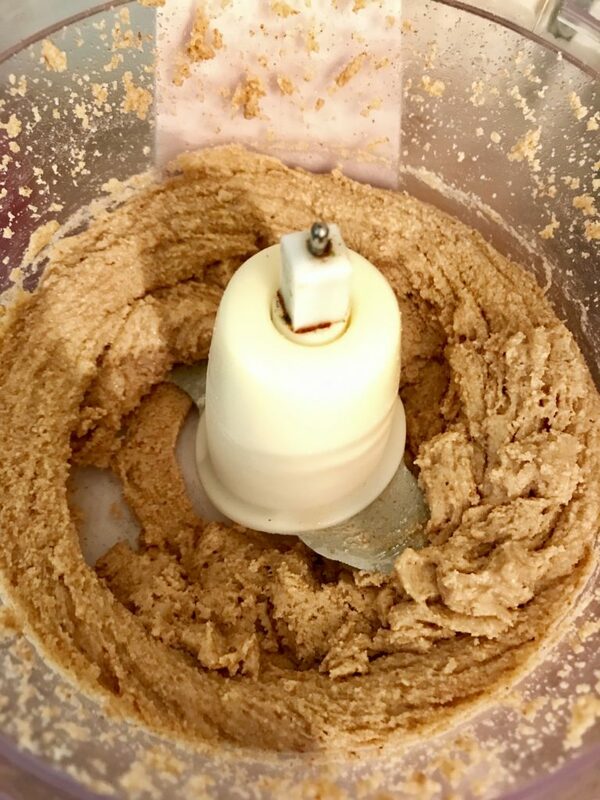 Process until desired consistency for about 20 minutes, stopping to scrape sides and give food processor a break occasionally. You can add optional ingredients to customize it: honey, cinnamon, vanilla, nutmeg, etc. Or just leave it pure, your choice. Transfer to jar; store in fridge. Do not store in plastic.